Having a Halloween party this year? Why not reward those people who worked hard on their costumes. People enjoy compliments and the Cutest Costume Halloween Ribbon is a big compliment to the person who worked hard on their costume. The Cutest Costume Halloween Ribbon is a black ribbon with white and yellow writing. Don't forget to check out our other fun creepy Halloween decorations that will get your guests ready to party! 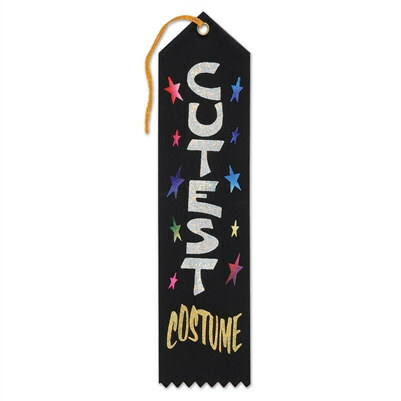 We also have other fun Halloween ribbon awards that will honor any of your guests.